Description : Camping near Delhi is very popular weekend getaway. One night away from the stressful city life in a quite remote place along with fun filled activities definitely rejuvenates your life. 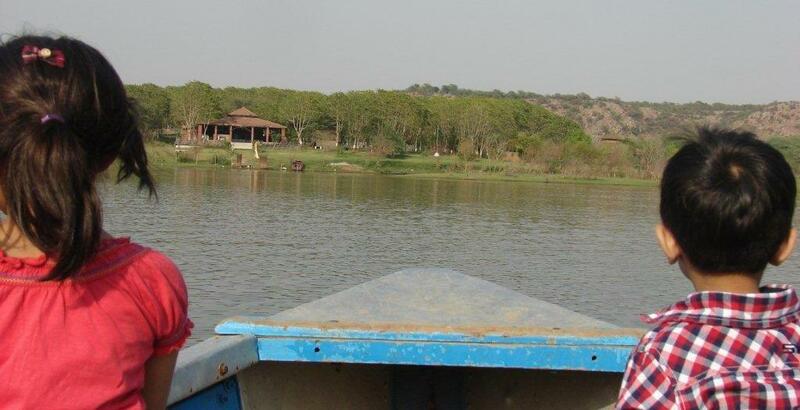 We will take you to the dream island which reachable by boat and Surround by water on 3 sides and the Arawali mountain range at the back, there is nothing more scenic than this around Delhi as a quick getaway. You spend your day/evening along with lot of adventure activities and come back with new spirit. 11:00 - 11:05 hrs : Arrive at the parking lot for Island and proceed to board the boat. 11:05 - 11:20 hrs : Transfer to the Dream Island by Motor boat. 11:20 - 11:30 hrs : Welcome drinks and explore the island. 14:00 - 15:00 hrs : Lakeside lunch buffet at the restaurant. 15:00 - 18:00 hrs : Relax on the lakeside hammocks, garden umbrella, and machan with tea/coffee with assorted pakoras. 20:00 - 21:30 hrs : Evening bon fire with music and dance. 21:30 - 22:30 hrs : Dinner and retire to air cooled cottage/ tent. 06:00 - 06:30 hrs : Wake up call and morning tea. 06:30 - 08:30 hrs : Trekking in the Aravali ranges to see a variety of birds, flora & fauna. 08:30 - 09:30 hrs : Enjoy the Breakfast. 11:00 - 11:30 hrs : Check out and proceed to your destination with sweet memories with Dare Adventures on Dream Island.